As the name indicates, the cirrocumulus undulatus are a high altitude cloud formation with an overall rippled shape. Unlike the lower cloud undulatus structures, these patterns can be differentiated through their thin appearance. In addition, while the low clouds have full rounded shapes, the cirrocumulus undulatus can also take the form of billows and rows. Moreover, the outline of these cloud formations is not always very well defined and their edges are not clear all of the times. On the other hand, their constant characteristic is that is that they are always separated by horizontal gaps. What height are cirrocumulus undulatus clouds found? 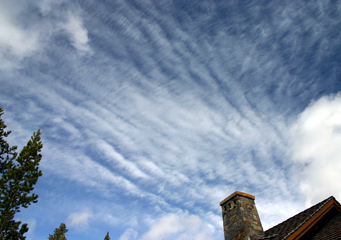 Similar to the cirrus and cirrostratus clouds, the cirrocumulus undulatus structures are considered high clouds. Consequentially, they usually form at around six thousand meters or twenty thousand feet above sea level in the atmosphere. In fact, all clouds that have the “cirro” prefix usually require very cold air fronts, generally bellow the freezing point, in order to develop. The reason for this is that they are mainly composed out of ice crystals, even though they can seldom include ice or water droplets. How are cirrocumulus undulatus clouds formed? The specific form of the undulatus formation is given by the influence of heavy winds. However, it is important to note that what keeps the pattern bundled together is the fact that they are bordered by two different air masses. While the other cirrocumulus structures are often a bit more challenging to identify, the undulatus is usually more defined and has a finer appearance. Moreover, the beauty of this pattern can easily be admired when a few of the formations, driven by winds, overlap each other. However, some people argue that the uniqueness of their shape is simply a result of their high altitude from the ground observer. What do cirrocumulus undulatus clouds look like? In fact, whilst the rounded or elongated shape of the individual clouds that form undulatus may create some difficulties in identifying them, what makes them distinct from other undulatus formations is the clear separation through well defined breaches. How common are cirrocumulus undulatus clouds? Normally, similar to the other cirrocumulus varieties, the undulatus are most common in the cold season, especially in winter. Their development on the sky is usually considered a sign of good weather, without precipitations. However, their presence also suggests a colder temperature. Even though these cloud patterns are not accompanied by rain or snow, according to meteorologists their presence in the western part of the sky usually indicates bad weather for the next day.